personal reference library selected and carefully looked after by the author over a period of nearly 70 years. In his biography, Martin Wickramasinghe has said that he became accustomed to buy a few books every month from HW Cave. He relates an amusing incident where the Manager of the bookshop came up to him and said : "I know that you come here and spend a lot of time referring many books before buying one. I don't mind that you use the bookshop like a public library, but please don't lick your finger and turn the page of the book you read ". 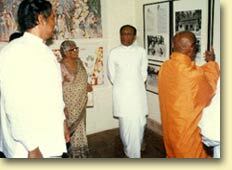 The collection reflects the wide diversity of subjects explored by Martin Wickramasinghe during his literary life. The collection includes many valuable and rare publications in fiction, literary criticism, anthropology, biological evolution, social sciences, Buddhism, comparative religion, philosophy, fine arts, amongst others. Annotations made by Martin Wickramasinghe can be yet deciphered on some pages of many of the books.The late Professor Joseph Needham, when he visited Sri Lanka to deliver the inaugural MartinWickramasinghe Lecture was delighted to read a rather adverse critical comment penciled by Martin Wickramasinghe in a page of one of Needham's books "Time, the Refreshing River". A database of the entire catalogue of over 5000 books has been prepared by the National Library and Documentation Centre. This data is being made available though this website and eventually also in compact disks. at the National Library premises. on the book shelves, arranged in just the same way that he had arranged them in his library when it was at in his residence in Nawala. 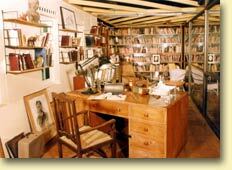 His writing table is also to be seen here.